The remainder are from context, from the book. This chapter is written using Python 2.6 syntax; it will be converted to Python 3 at a later date. Objects are created by other objects: special objects called “classes” that we can set up to spit out objects that are configured to our liking. >>> Foo.method = lambda self: "Hi!" To modify a class, you perform operations on it like any other object. You can add and subtract fields and methods, for example. The difference is that any change you make to a class affects all the objects of that class, even the ones that have already been instantiated. What creates these special “class” objects? Other special objects, called metaclasses. The default metaclass is called type and in the vast majority of cases it does the right thing. In some situations, however, you can gain leverage by modifying the way that classes are produced – typically by performing extra actions or injecting code. When this is the case, you can use metaclass programming to modify the way that some of your class objects are created. It’s worth re-emphasizing that in the vast majority of cases, you don’t need metaclasses, because it’s a fascinating toy and the temptation to use it everywhere can be overwhelming. Some of the examples in this chapter will show both metaclass and non-metaclass solutions to a problem, so you can see that there’s usually another (often simpler) approach. Some of the functionality that was previously only available with metaclasses is now available in a simpler form using class decorators. It is still useful, however, to understand metaclasses, and certain results can still be achieved only through metaclass programming. So metaclasses create classes, and classes create instances. Normally when we write a class, the default metaclass type is automatically invoked to create that class, and we aren’t even aware that it’s happening. Classes are often referred to as “types,” so this reads fairly sensibly: you’re calling a function that creates a new type based on its arguments. Note that printing the class of the class produces the metaclass. "So sort() will compare only on time." "Create subclass using the 'type' metaclass"
"Create subclass by exec-ing a string"
The Event base class is the same. The classes are created automatically using the create_mc() function, which takes its description argument and generates a class name from it. Then it defines an __init__() method, which it puts into the namespace dictionary for the type call, producing a new subclass of Event. Note that the resulting class must be inserted into the global namespace, otherwise it will not be seen. This approach works fine, but then consider the subsequent create_exec() function, which accomplishes the same thing by calling exec on a string defining the class. This will be much easier to understand by the vast majority of the people reading your code: those who do not understand metaclasses. Writing a subclass of the metaclass type. Inserting the new metaclass into the class creation process using the metaclass hook. In Python 2.x, the metaclass hook is a static field in the class called __metaclass__. In the ordinary case, this is not assigned so Python just uses type to create the class. But if you define __metaclass__ to point to a callable, Python will call __metaclass__() after the initial creation of the class object, passing in the class object, the class name, the list of base classes and the namespace dictionary. Python 2.x also allows you to assign to the global __metaclass__ hook, which will be used if there is not a class-local __metaclass__ hook (is there an equivalent in Python 3?). cls.uses_metaclass = lambda self : "Yes!" By convention, when defining metaclasses cls is used rather than self as the first argument to all methods except __new__() (which uses mcl, for reasons explained later). cls is the class object that is being modified. Note that the practice of calling the base-class constructor first (via super()) in the derived-class constructor should be followed with metaclasses as well. The compiler won’t accept the super() call because it says __metaclass__ hasn’t been defined, forcing us to use the specific call to type.__init__(). As you’ll see, Python 3 doesn’t allow the syntax of these last two examples. Even so, the above example makes it quite clear what’s happening: the class object is created, then modified, then returned. Or does it allow that syntax? This means that none of the (clever) alternative ways of defining __metaclass__ directly as a class or function are available in Python 3 [[check this]]. All metaclasses must be defined as separate classes. This is probably just as well, as it makes metaclass programs more consistent and thus easier to read and understand. It is sometimes convienient to use inheritance as an organizing mechanism – each sublclass becomes an element of a group that you work on. For example, in CodeManager.py in the Comprehensions chapter, the subclasses of Language were all the languages that needed to be processed. Each Language subclass described specific processing traits for that language. Two separate tests are used to show that the registries are independent of each other. Each test shows what happens when another level of leaf classes are added – the former leaf becomes a base class, and so is removed from the registry. This also introduces metamethods, which are defined in the metaclass so that they become methods of the class. That is, you call them on the class rather than object instances, and their first argument is the class object rather than self. During class object creation, we check to see if any of the bases are derived from final. Notice that using a metaclass makes the new type an instance of that metaclass, even though the metaclass doesn’t show up in the base-class list. Because this process of checking for finality must be installed to happen as the subclasses are created, rather than afterwards as performed by class decorators, it appears that this is an example of something that requires metaclasses and can’t be accomplished with class decorators. It can be confusing when you see metaclass examples that appear to arbitrarily use __new__ or __init__ – why choose one over the other? The primary difference is that when overriding __new__() you can change things like the ‘name’, ‘bases’ and ‘namespace’ arguments before you call the super constructor and it will have an effect, but doing the same thing in __init__() you won’t get any results from the constructor call. One special case in __new__() is that you can manipulate things like __slots__, but in __init__() you can’t. Note that, since the base-class version of __init__() doesn’t make any modifications, it makes sense to call it first, then perform any additional operations. In C++ and Java, the base-class constructor must be called as the first operation in a derived-class constructor, which makes sense because derived-class constructions can then build upon base-class foundations. In many cases, the choice of __new__() vs __init__() is a style issue and doesn’t matter, but because __new__() can do everything and __init__() is slightly more limited, some people just start using __new__() and stick with it. This use can be confusing – I tend to hunt for the reason that __init__() has been chosen, and if I can’t find it wonder whether the author knew what they were doing. I prefer to only use __new__() when it has meaning – when you must in order to change things that only __new__() can change. A metamethod can be called from either the metaclass or from the class, but not from an instance. A classmethod can be called from either a class or its instances, but is not part of the metaclass. By overriding __call__() in the metaclass, the creation of instances are intercepted. Instance creation is bypassed if one already exists. Note the dependence upon the behavior of static class fields. When cls.instance is first read, it gets the static value of instance from the metaclass, which is None. However, when the assignment is made, Python creates a local version for the particular class, and the next time cls.instance is read, it sees that local version. Because of this behavior, each class ends up with its own class-specific instance field (thus instance is not somehow being “inherited” from the metaclass). "Simple replacement of object creation operation"
of the instances AND the class object. def __repr__(self) : return klass.__name__ + " obj"
print str(cls) + " __call__ "
For an example of using both __prepare__() and __slots__ in metaclasses, see Michele Simionato’s article. Note that the metaclass argument is singular – you can’t attach more than one metaclass to a class. However, through multiple inheritance you can accidentally end up with more than one metaclass, and this produces a conflict which must be resolved. 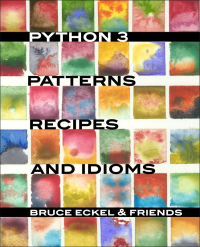 The printed version of the Python Cookbook has far fewer examples than the online version, but the print version has been filtered and edited and so tends to be more authoritative. For more advanced study, the book Putting Metaclasses to Work. © Copyright 2008, Creative Commons Attribution-Share Alike 3.0. Revision 59754c87cfb0.